The other morning I was in the wilds of the Cheoah Ranger District below the Cherohala Skyway sawing and dragging trees out of Forest Service roads so I could get to my bird points for this year’s survey. Rather than paying attention to where my digits and/or limbs were as I was sawing and where the “pressure” points were and how to saw so that I wouldn’t bind my blade, my ADD kicked in and I remembered the last Waynesville Watershed hike and Dr. Pete Bates, professor of natural resources at Western Carolina University and lead researcher of Waynesville’s Watershed Management plan, talking about the watershed’s restoration plan. Bates noted that the management plan’s focus was on restoration of a healthy, diverse forest and the best way to achieve that was to mimic (as closely as possible) nature. One of the silviculture tools he talked of was creating gaps. There is a lot of talk today about “edge species.” These are species like white-tailed deer in the mammal world and golden-winged warblers in the bird world – species that thrive in new, often, brushy growth. If you listened to some people you would be led to believe that the survival of edge species depends on more and more frequent clearcuts. Truth is white-tailed deer, golden-winged warbler and other ‘edge” species thrived in the “New World” long before timbering and/or forestry was ever introduced. How did they do it? The answer is gaps. 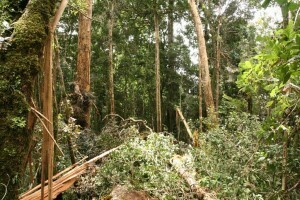 In mature or old growth forests, trees often tumble to the ground. There are a myriad of reasons. 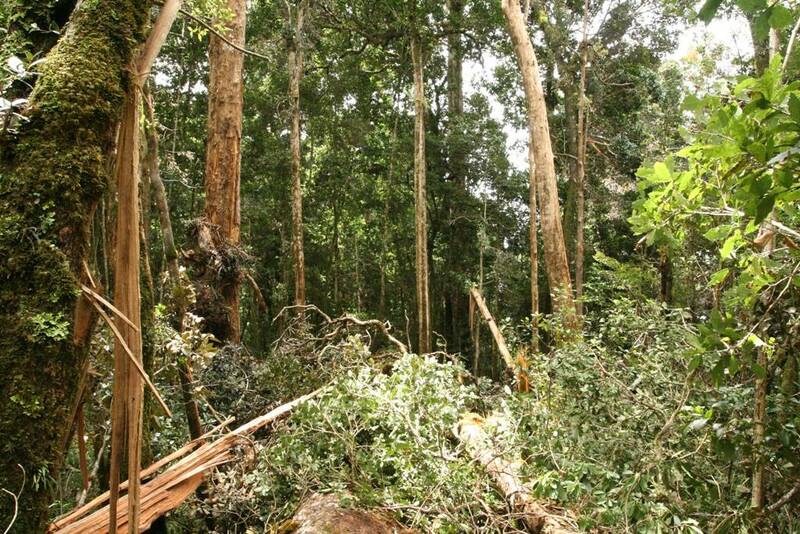 It could be old age – after 500 or 600 years some trees just die. It could be hard winters or windstorms or any combination. It could, occasionally be fire. What is lost in most of today’s forests is scope and perspective. A 400-year old red oak crashing to a primeval forest floor, taking collateral damage with it as it falls could easily create a two to three acre clearing. This clearing or “gap” is home to edge species. Forest gaps are where and how edge species survived, thrived and/or ebb and flowed as time marched relentlessly onward. The need to have burgeoning populations of white-tailed deer or other gap species as targets for hunters in hopes of keeping wildlife agency coffers full has little “natural” appeal for me. The idea of managing properties and/or forests in a holistic way that mimics (to the best of our ability) natural processes is an idea our grandchildren and the wildlife that makes their lives complete can live with. Damn! How did that chain get stuck! OFFICIAL DISCLAIMER: The Forest Service with all its budget shortfalls and incredible workload does an amazing job with maintenance upkeep. Many of the roads I traverse to get to my bird points are “fire” roads and they are cleared regularly – thank you, thank you. Some of the backcountry roads are not fire roads and they get cleared as time and resources allow. If you’re a FS employee with a chainsaw in the back of your truck and happen to bump into a tree blocking one of these roads during your travels, instead of selecting an alternate route how about cutting that tree out of the road and I will gladly compensate you with the beverage of your choice!